They fled the darkest corners of Eastern Europe. Their story was written thousands of times over by people who risked everything to live a dream. Only a few would welcome them. THE IMMIGRANT, a new off-Broadway musical produced by Hello Entertainment, celebrates one such story in the most unlikely of places - Hamilton, Texas. This remarkable quirk in history is the beginning of the true story of Haskell Harelik who rose from street peddler to become the owner of a prominent department store. The New York Times calls it "A deeply satisfying new musical, with much on its mind about history, humanity, man and God and the American Dream, [it] touches the heart and glows with humor." 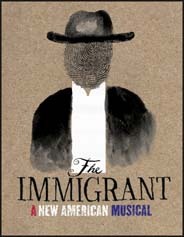 THE IMMIGRANT begins performances at the new DODGER STAGES on 340 West 50th Street between 8th and 9th Avenue on November 4th.